Hair dye, work and mikado - Cherry Colors - Cosmetics Heaven! Today I didn't expect to go to work, but I had to... Something sad happened to my older sis's cat so I had to change her (yeah we work at the same office). There I took this super bad picture and edited it out in the cute little program (xiuxiu). I had dirty hair, no make up and a bit chipped nail polish on my thumb finger. YAY! I had no time to take a shower, eat or anything. I just had to go to work ASAP. Plus I didn't dye my hair for more than two months. I couldn't find my brand of dye anymore! At least not in the tone I needed! (Keune 1001) Bwah! But the roots were critical, so I got a new hair color. Subrina Saten Blondes 20/2. Mikado - pockys! 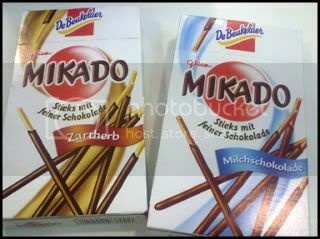 We call them mikado because that's the only brand that sells those here! Well to be honest, I sent my bf to get me some hair dye, since I was at work. He also bought me a snack! 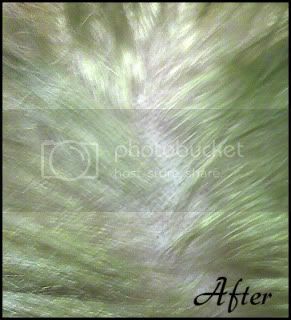 Later I went to the same store - during lunch, to get anotrer box, because I wanted to dye my whole hair and normally 1 box is't enough. 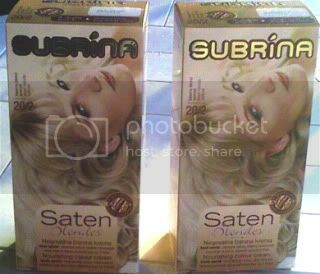 Subrina, a local brand created back in the 1958 in Yugoslavia... The dye is cheaper than the one I normally use. I normally use Keune colors (you have to buy the color + hydrogen), so both are about 10€ together. So if I need two of them for my whole hair then it's 20€. But I only dye my roots so it's okay I guess. This color was a little more than 5€, so both were a little over 10€ and that's half cheaper than my regular hair color! Plus I didn't have to buy the hydrogen! I bought two of the same dye, because I wanted to start out fresh. I didn't want to have 3 different tones on my hair! The before picture! Dirty and greasy hair, very visible roots: The after picture (super bad light, it's NOT green! 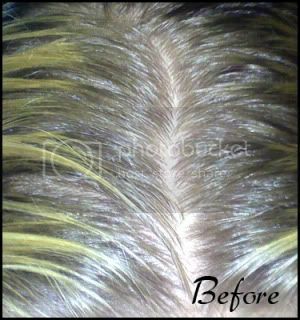 tomorrow I will take pictures so you will see): I firstly dyed my roots. I put on the color, waited for 30 minutes and then colored the rest of my hair and waited for 10 minutes. I had plenty of hair dye leftovers! So I dyed my twin sis's roots too! The color is also runnier than the Keune color. And I do like that, because this way, I use sooo much less of it for the same result! The only thing that I didn't like was the hair mask included in the box. I can't stand Subrina's hair masks/balsams smell. It smells like some old people perfume, or even worse. Like a perfume gone bad. Plus the smell stays on for DAYS! Even if I wash my hair for million times, it will still be there! Why doesn't that happen with some good smells?! Another downside is the fact that I got now some grayish hair, I mean white. Because on some part of my hair (bangs!!) the Keune dye had a stronger effect, and now it shows up like this! But I don't really care since it's not too visible. I also cut my bangs. Not too short, because of the heat, but like 20 cm off... :P And oh, I am dying for my contact lenses to come! I ordered a pair of Nudy Blue and I will get a replacement pair of Angel Green, because for some reason I can't see well with then when I look at something that's close to me (like monitor). Buh.